A historic experience in the heart of Lovington! 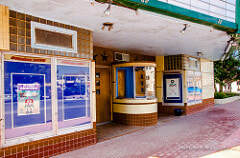 ​The Lea Theatre is located in downtown Lovington, New Mexico. Opened in 1948 and listed on the National Register of Historic Places, the Theatre remains in operation today and shows a variety of 1st run movies. Watching a modern day movie in the Lea Theatre is like no other. View a modern day movie using the latest digital technology while being surrounded by the historic ambience of an Art Deco period theatre. We invite you to visit and experience it yourself! Friday, Saturday, Sunday & Tuesday at 7:00 p.m.
Book our facility for your special event! Check back often for our own special events and packages that we offer!